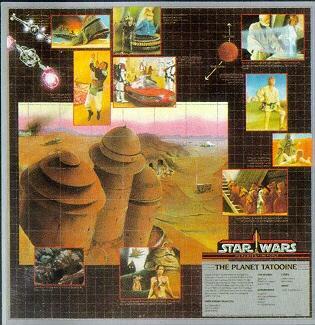 The Tatooine map shows a painted scene in the center from the exterior of Jabba's Palace, surrounded by various smaller, relevant paintings. 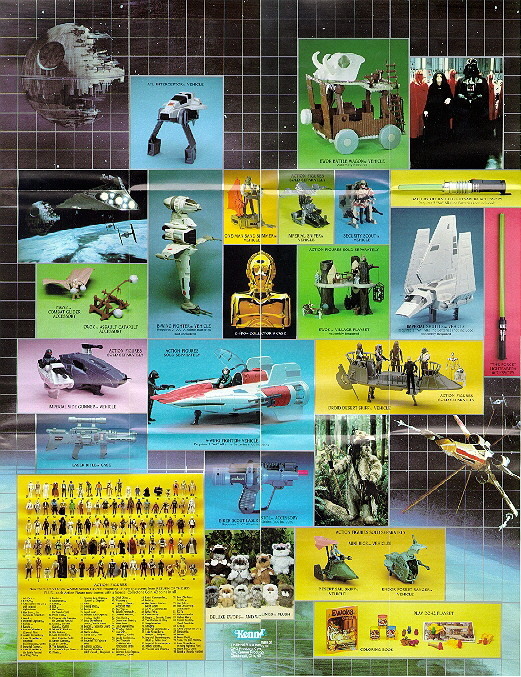 The final two border images are of an X-Wing and a Y-Wing. The painting of the planet has two arrows pointing to other planets in the SW Universe. The northerly arrow states "To Hoth" and the SW one "To Bespin". It is not known whether Bespin and Hoth were planned as Maps, but seems likely if the line had continued. Characterized by vast deserts and glaring twin suns, Tatooine is the largest planet in the tatooine star system and the home of Luke Skywalker and his Uncle Owen adn Aunt Beru Lars. This inhospitable world was also the site of such historic events as Luke's first meeting with R2-D2, C-3PO, and Ben Kenobi; and later, the rescue of Han Solo from the gangster, Jabba the Hutt.